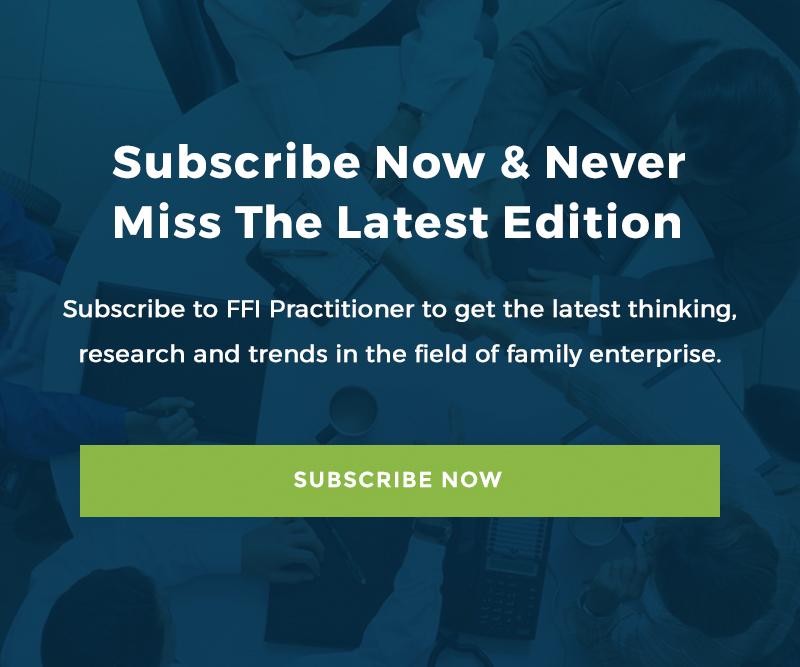 This week’s FFI Practitioner concludes our two-part series commemorating the 40th anniversary of the influential Three-Circle Model. Thank you to FFI Fellows, Pramodita Sharma and John Davis for sharing their insightful conversation about the future of the model, research, and the field. Her comment made me think perhaps we should use the three-circle model in our PhD programs, because if you think about the theories we refer to, e.g., agency theory, resource-based theory, we can go back to the three circle regions and say, OK, where does a theory like agency theory fall in the three circles? What issues of the three-circle model are we trying to address with it? The three-circle model is the starting place to understand these systems. I really believe the model’s impact is only now beginning to show. When I put three-circle model on the board, people can use it to think in a theoretical way, as well as locate themselves in the model as practitioners. In my case, teaching, for example, most of the variants that you’re trying to capture in a case and to get people to talk about have to do with the seven regions in the three circles. It’s not as if it’s all we talk about, but after people have used the three-circle model in traditional ways, they try to use it to explore other issues. For instance, the implications of wealth in the business, or in the family, or both. It seems like there is no question that we’re talking about another dimension. Can you, or did you ever, imagine positioning a wealth circle? John Davis (JD): First, it’s gratifying to hear that your students and you think the three-circle model is useful theoretically and managerially. That never fails to buoy me. I agree that the model is a foundation for understanding the family business system. Other theories like agency theory can be understood in the context of the three-circle model. Unfortunately, and not to get distracted here, but it’s disappointing that some reviewers for journal articles I have submitted recently see “no relevance” for the three-circle model. Seriously? While you, a highly respected researcher and theoretician, are deeply understanding of family business system issues and appreciative of the power of those three little circles, other academics in the field are not. But I am the first to recognize that the three-circle model is not designed to answer all important questions in our field. No framework can. Take the interesting topic of family wealth. While every family owner of a family business is a wealth holder, a family’s wealth includes assets outside the family business, and some family members could be a holder of some family wealth and not an owner of the family business. Believe me, I have played with adding a fourth wealth circle and couldn’t make it work conceptually. The same conceptual limitation in the model is there to distinguish family members that are engaged in social impact activities. The three-circle model can’t cleanly handle the distinction in general. But you can still make notations about a particular family’s three-circle map to indicate particular groupings of interests. PS: I’ve always wondered if we could get away from two dimensions. If we could see some things in three dimensions that would be different or more powerful than what we currently seem capable of. In 2011, I was asked to speak on governance of a family and its enterprise at a conference in Taiwan. That’s the first time I used a three-sphere model as opposed to the three circles. I had all these different kinds of flowers and said, well, this is your family. These different flowers, some of them fading, others are in full bloom, and some are buds, etc., represent all the kinds of people in the family. Similarly, I used fish in a pond for another circle, and drops in an ocean for the third. So, we have the three circles and we have the seven regions, but even within the regions there are differences. I think that more dimensions could offer some insights that we can’t appreciate now. I have drawn three spheres too but couldn’t get to new understandings through a three-dimensional representation. I think it would be cool to see a hologram where you could peer into the regions of each sphere and ask questions. Maybe we would appreciate the interconnections of the three systems better than we can today. I think there’s a richness in the model that we haven’t explored yet. I’m so looking forward to getting to that stage in our thinking and practice! Where do you see us going? And where would you like us to slow down and take a moment to reflect on where we’ve been? JD: It’s very impressive to me to see all the good thinkers and researchers who have discovered this field and are writing about it and having useful things to say. Right behind me in my office is my collection of FBR. Often, I find myself pulling out a specific year and looking to see what was written then. We’ve come a long way since 1984. I want researchers to understand the family business system to gauge how their particular research fits into the broad issues of the three-circle model. That takes extra effort on the part of researchers but I hope they do it. Research will be more useful if that happens. My chief frustration in our field is not with our researchers but with academic institutions. Most business schools still regard family business as a niche topic and that may be exaggerating the importance they attach to it. They don’t encourage research on this topic although they don’t discourage it as they did in the early days. Back then, the biases against, and the lack of awareness about family companies, was tremendous. Business schools then were convinced that family companies were insignificant, prehistoric organizations going out of business. Business schools now say they recognize the importance of family companies. They just choose to not fund much research on the topic. This is mostly a legacy issue. The current pool of professors studied non-family public companies or generic issues inside organizations and that’s what they encourage the doctoral students coming up behind them to study. But every faculty member in a business school should know the demography of the world economy or at least his or her local one. If you ask doctoral students today—pick any country, US, Canada, India, France—what does the demography of business organizations look like? What percent of companies are family owned or are non-family partnerships? What percent of businesses are big or small? You rarely get more than a handful of doctoral students who know the answers, and they have no ideas. Why? Because professors in business school don’t know either. PS: It’s a point well taken. To me, it’s also an opportunity. I think we are making headway with people who talk in the research language. For example, by getting and reading the Academy of Management Journal regularly and being a contributor at the Academy of Management meetings, I get a ticket to converse with other scholars, understand their perspectives, and seed family business ideas. We’re finding that family business researchers who are making headway as academics are frequently actively engaged with family business owners — often younger members of these families. They can speak both languages. That can help bridge this gap. I’m thinking about having a doctoral symposium where students from anywhere in the world can come and be with us for four or five days and with professors like you who have that mindset. I think that’s how we re-seed the curiosity and build usable knowledge while contributing to the highest level of academic writing as well. It will take me a year or two to organize such a symposium and pull it off. But I definitely have that as my next step. JD: And, when you do it, I’ll be there!